There is just something really warm and inviting about a room with the look of a flickering candle in it. Using candles in the home creates an intimacy that sets a mood to a room and makes guests feel really welcome. Arranged pleasantly with just the right accessories, a candle can really transform the look of any area in your home. This post is sponsored by Chesapeake Bay Candle, but all opinions are 100% my own. I am really an easy person to please. Give me some fresh flowers, a few of my favorite sweet treats and the delightful scent of a candle burning, and I am a happy camper. My home is decorated simply and I use candles in almost every room to add instant mood and warmth. I was delighted, recently, when the Chesapeake Bay Candle Company sent me three candles from their Alassis Collection. My delight started from the moment I opened the box. Each candle was wrapped in layers of bubble wrap for protection, and each bubble wrapped package was HEAVY. Even before opening the packaging, I knew that I was in for a treat. Not only were the art glass candle holders themselves beautiful, but so was their fancy packaging. It is perfect for gift giving. (Not that I plan to give these away. They are MINE!) And crafter that I am, as soon as I saw the wonderful containers, I knew that they would be re-purposed later when I had finished burning the candles. I’ll just clean them out and use them as holders for trinkets or even planters for succulents. They are THAT pretty! Seeing the lovely candles, I could not wait to get started thinking about how to display them around my house. 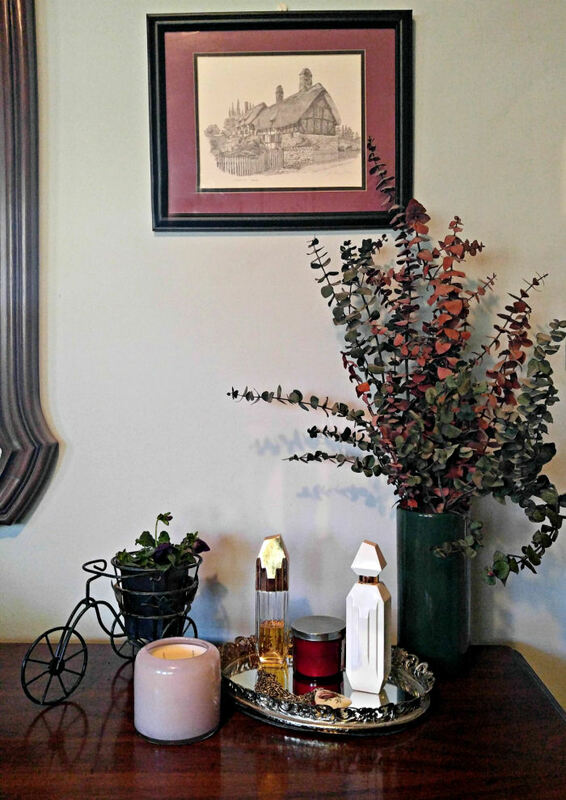 I thought it would be fun to share with you some of my tips for using candles in my home. I hope that they will inspire you to find new ways to use them in yours. For me using candles means using flowers. They go so well together. I love fresh flowers. I have a huge cottage style garden and enjoy flowers all throughout the year, both indoors and out. These hellebore flowers coordinate beautifully with my pretty Alassis blush orchid and plum candle. Add in a dish of your favorite chocolates and you have a lovely display that is perfect to have in a reading nook for some me time. Can you believe this plant flowers all winter long? This finely scented Alassis soy candle is designed and poured in the USA and has the aroma of blush orchid and plum mingled with other delightful notes. It is the perfect scent to make you think of the gardens along the Mediterranean coastline. The beautiful hand-blown art glass has a burn time of approximately 40 hours. I can read a whole book while the candle burns! One of my favorite ways for using candles in the home is to place them in the bathroom. Unwinding after a hard day out with a warm bubble bath is one of life’s great pleasures. 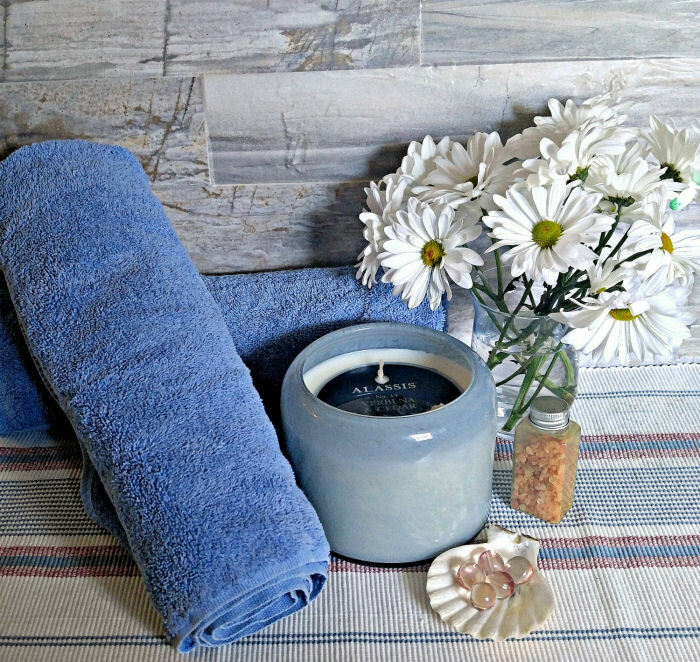 Match your candle colors to the decor of your bathroom and towels and you will think you are having a spa day! If you have a bath tray, arrange the candles, a glass of wine and a book and get ready to sink into bliss. You can move the tray to another area of the bath when you are done soaking for a decor look. The delightful aroma of the Alassis Verbena and Cedar candle brings to mind picturesque Italian villages nestled in the hills above the sea. The scent of violet leaves, orange flowers and white roses adds another dimension to the aroma The pretty hand blown art glass matches my colors and the three wicks give off a lovely glow for 65 hours. Now THAT is a bath! Family get togethers are much more cozy with candle lighting in the living room. There are lots of places to put candles for decoration in the main gathering room of your home. We spend so much time in it, why not make it really special looking (and feeling.) 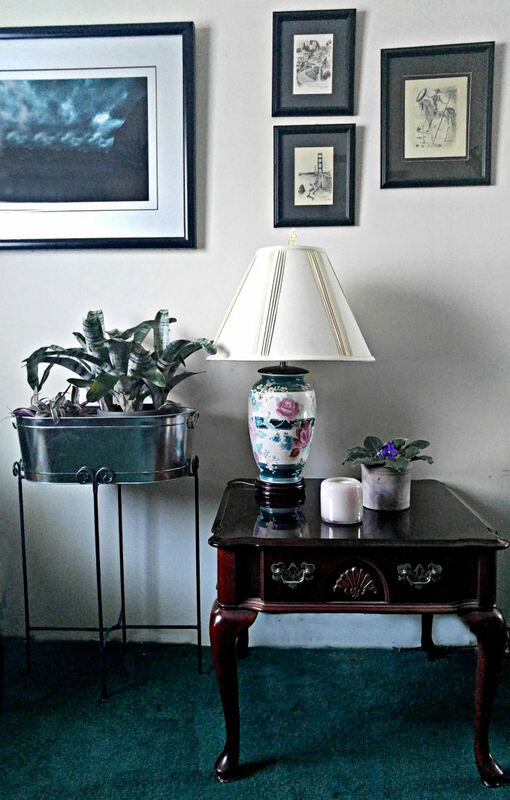 The pink hand-blown glass surrounding the plum candle matches both my lamp base and my African Violet rustic planter. It adds a special touch to an otherwise bare table. Coffee tables are also great places for candles. Stack some of your favorite books or magazines and top them with a candle for height. Instant decor! 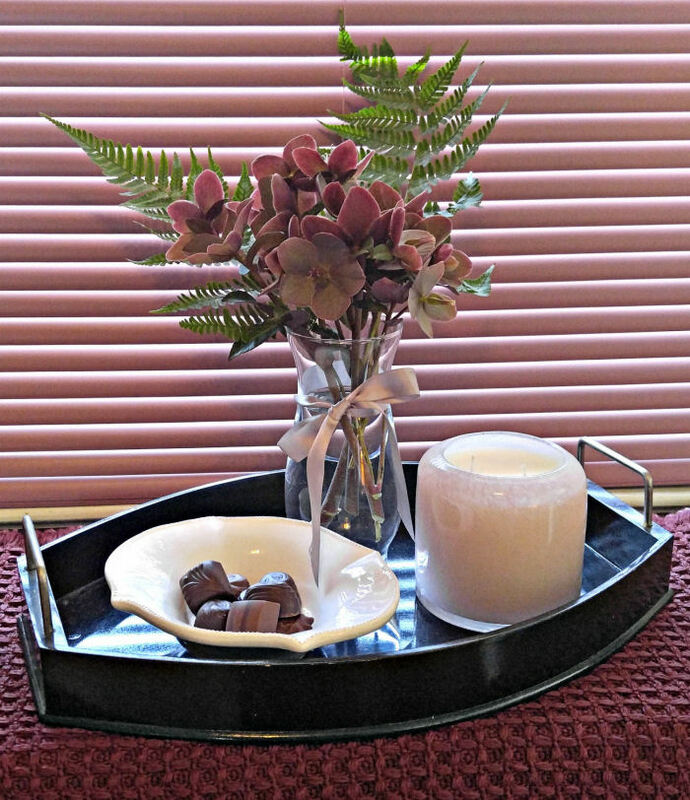 Another easy idea is to place a set of candles a decorative tray. This tray will be functional when it is the living room and then can be moved around to give them same look quickly to another room. Depending on the style of your living room, candles can add more than just additional lighting. They can add mood, warmth and an additional touch of whatever your decorating style is. The bedroom is a place for relaxation and romance. Of all the rooms in the home, the bedroom is where candles give off the most cozy feel. You can light them on a bedside table, or place them as I have on a dresser in a little display. This time I used dried eucalyptus stems and a live pansy in a cute little tricycle planter for a fun effect. A mirrored tray gives dimension to the look and gives me a place to put perfumes and hand lotions, as well as the odd piece of jewelry. I use candles all the time in my dining room. I do this when we entertain guests and I also use them when I want to have a romantic dinner for just Richard and me. Candles on a dining room table create a relaxing mood and can be used effectively to improve the ambiance to its best. Subtle lighting is both relaxing and beautiful and the fragrance of the candle can be adjusted to the meal choice. Who can resist a quiet candlelight dinner with glowing candles, arranged with fresh flowers, all beautifully coordinated together for one harmonious look? I used English daisies, hellebore, mums, daffodils and pansies for my centerpiece. The colors coordinate well with the Alassis Mandarin and Grapefruit candle. Looks like fruit will be on the menu tonight! This candle has an interesting musky flavor that I have not noted in other candles. 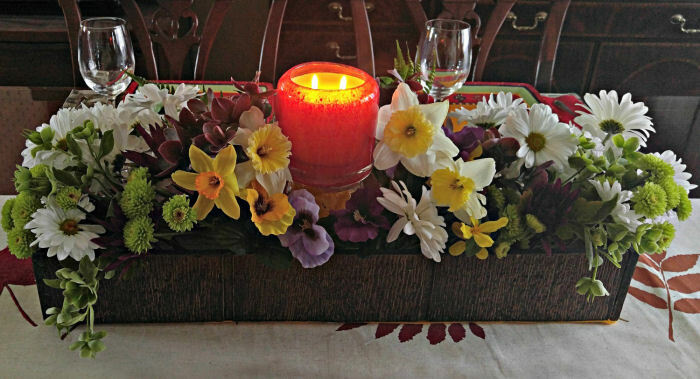 TIP: I raised the candle by placing an upside down glass filled with daffodil heads. This gave height to the centerpiece and also made sure that nothing in it catches on fire. To set up your entry for the ultimate welcome, invite your guests inside with a trio of candles just waiting to be lit for the occasion. Their refreshing scents and a warm glows make this one of the easiest ways to say hello! Adding something under the candles to add height gives a more balanced look to the trio. The black Alassis display boxes work beautifully and also compliment an upside down black bowl! As always, I have incorporated something from my garden to the vignette. This time, it is the dried stalks of Japanese silver grass and hardy succulent flowers that dried on the plant. Both plants die back in the winter, but I leave the blossoms to dry so that the birds have a winter snack. Candles are not just for indoors! Using candles does not just mean putting them in indoor settings. Use them lighted on your steps when you have guests arriving for an instant mood setter. 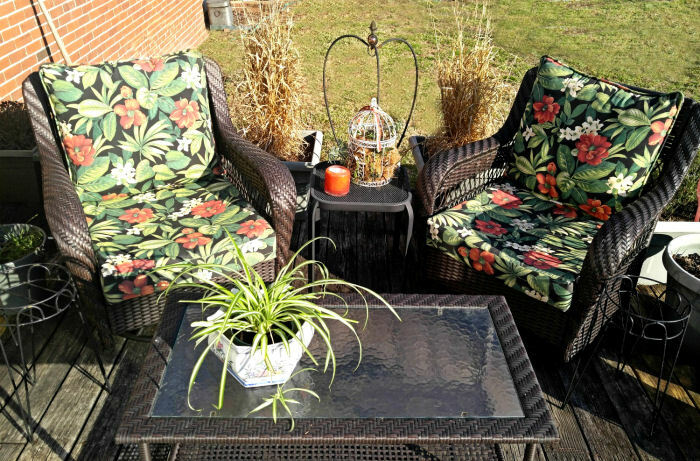 On the patio, when placed on an outdoor table, they bring a touch of the indoors outside and extend your living space. As an added bonus, candles will keep away bugs when you burn them outside! Any outdoor gathering area can benefit from the use of candle illumination. They are perfect to set the mood for an outdoor alfresco dinner. I placed my candle near a bird cage planted with succulents for a fun look. The color of the candle looks great with my patio cushions! Candles are one of my favorite items for gifts. There are so many ways to gift candles. 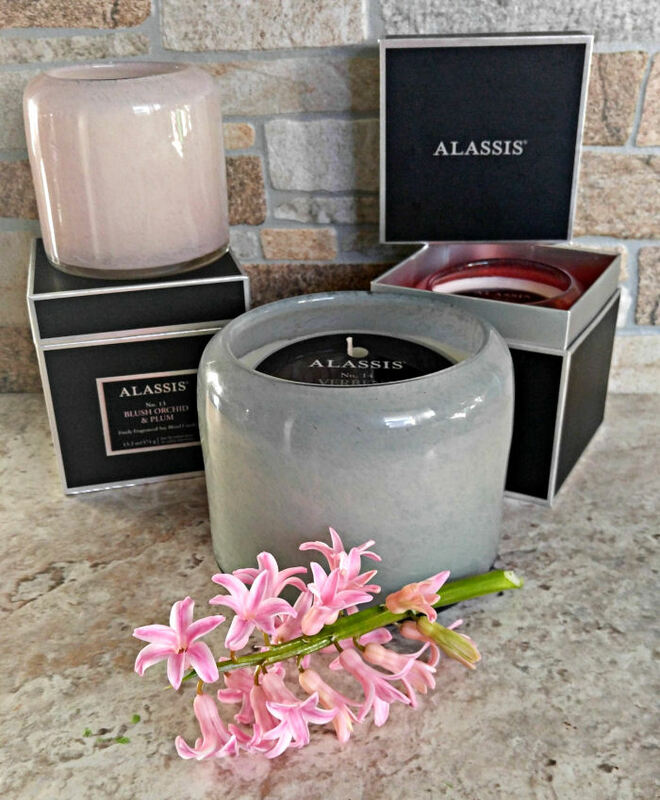 Alassis candles come beautifully gift boxed, but just add a pretty satin ribbon and you have the perfect presentation. Candles can be used as gifts for so many occasions. Looking for an anniversary gift? Why not try creating a gift that will make the recipient think of a candle-lit dinner for two? Line a pretty basket with some coordinating table napkins, then add your candle along with a couple of champagne flutes, and your recipient will be thinking ahead with anticipation to their anniversary night! I hope that I have given you some inspiration and ideas for using candles around your home. Be sure to visit the Chesapeake Bay Candle site to see their entire range of beautiful candles in all sorts of scents and colors. Alassis is only one of their amazing collections. This exquisite collection is inspired by early Mediterranean cultures. The collection was created in 2012 by co-founder and creative director the Chesapeake Bay Candle Company, Mei Xu. Mei was born in China and lives in the USA. Fragrance has been a passion of hers for her whole life. You can find The Chesapeake Bay Candle Company on Pinterest, Twitter, Facebook and Instagram, too. ← Seed Types: Open Pollinated, Heirloom and Hybrid. Those are such beautiful candles! I bet they smell lovely too! They really do. I loved adding them to my home. 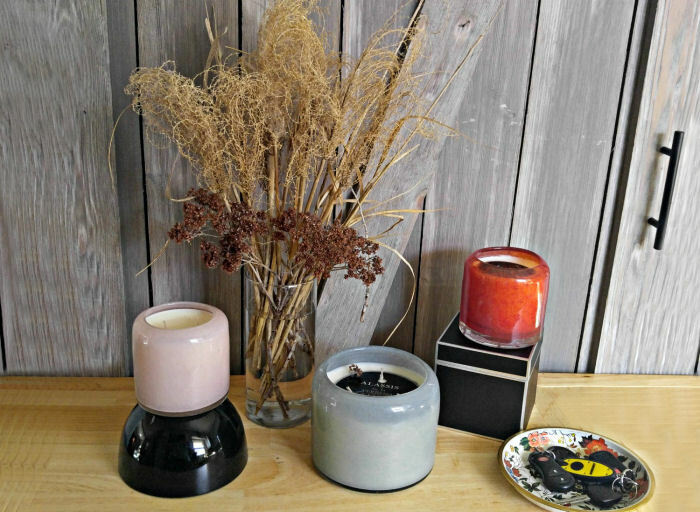 Besides the fact that these candles have the best scents ever, I love how the different colours can be used as an accent colour in rooms around the house. I also love candles and enjoy decorating my home with them. I like that the Chesapeake Bay Candle Company candles you received came in decorative jars. They can definitely be repurposed once the candles burn down. I usually use candles in my living room. I love putting a cluster of different sized candles on a floating shelf. It adds a nice decorative touch to my walls! I am a huge fan of there candles I love to use them when I relax in the tub after a long day of work the scents are so refreshing. These candles look amazing! I adore scented candles and candlelight! I agree with you, there is always something super inviting about a lit candle. Especially one that is giving off a deliciously yummy scent! We are avid candle burners here. We enjoy having inviting scents throughout the house. I think my favorite spots are the bathroom and living area. My hubby is the one that usually picks up his favorite scent from the store. I used to own a gift shop and we sold all types of candles. They smelled so good. I love using candles everywhere. I want to use more outside but I live in Oklahoma and the wind is crazy. I love candles! They set the mood and the scent relaxes me so much. It has to be used carefully though. Thanks for the amazing ideas Carol! Where do you usually buy your candles? Thanks for the great tips for decorating with candles. Putting candles in a the small reading area we have upstairs would be perfect! If we combine that with some fresh flowers, I don’t think I’d ever leave that space. I love candles. They add instant coziness and warmth in any room. That set-up you made for the dining room looks great; it’s so colorful. I also like your tip to raise the candle for it not to catch fire. Thanks for posting! I really love candles and have been looking for good ways of using it around the home. I really appreciated the tip about different locations to put the candles like in the reading nook. Reading by a candle is one of my favourite things to do. It sure got me when you said that lighting the candle in the bedroom is a nice idea because it is the place where it gives off the coziest feel. Actually, that is why I intend to get a candle lantern. Instead of using light, I thought that maybe I can use a candle to illuminate the room like an accent light. Seeing this article made me think like my idea was right. Thanks! There are times where I want to to have a candle by the reading nook so I might buy some home lighting products such as candles to help lighten the nook. In order to make my bathroom time more luxurious, I might add some candles there as well. Sometimes, the family likes a cozier alternative to our normal lights as well so I might buy some for the living room. 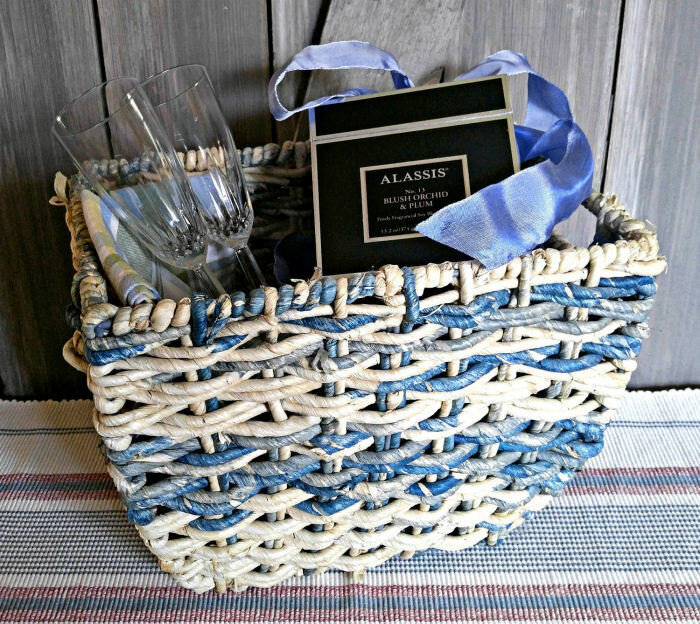 I like your anniversary gift idea to get some candles, napkins, and champagne glasses in a basket. My brother’s anniversary is coming up and he asked for my help planning the night. The candles would be both an atmospheric and functional gift, so I’m really glad you shared that idea. Glad you liked the idea Daphne.